"For decades, caged snakes have literally had almost no room to move - now there should be no room for such abuse” - Cliffard Warwick. New research has concluded that snakes should not be confined to enclosures that prevent them from fully stretching their bodies. 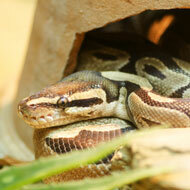 The study, published in the Journal of Veterinary Behaviour, conducted research at eight UK zoos and reviewed around 100 publications on snake welfare, biology and caging. During 60-minute observation periods at the zoos, researchers observed 37 per cent of snakes adopting straight or near-straight-line postures. The authors conclude that such behaviour confirms that snakes do utilise and need considerable space as part of their normal lifestyles. ‘Spatial deprivations routinely imposed on snakes would be unacceptable for any other vertebrate species, and while larger enclosures may represent significant inconveniences for many snake breeders and keepers, current common approaches to accommodation for many snakes are scientifically and ethically unjustifiable,’ the authors write. The study comes four months after new animal welfare licensing regulations came into force covering the sale of pet snakes. The legislation was compiled by stakeholders who agreed snakes should be kept in containers at least the length of their bodies. But while the provision had been included in the draft guidelines for almost a year, it was reportedly pulled following a complaint made by a veterinary clinic associated with the pet trade. Leading veterinary surgeons, biologists and animal welfare organisations highly criticised the move and issued a call for the rule to be reinstated.